You did it! Congratulations! I am very impressed! You wrote 24 poems in 24 hours. This is an achievement that few poets ever accomplish. Although if you are a returning marathoner, some of you might be accomplishing it for the second or third time or even fourth time! Now you should probably go get some sleep. After every marathon I have participated in I, have been filled with exhaustion but also a tremendous sense of achievement. I hope you have that too. In the past I have personally verified that everyone who applied for a certificate was eligible and then I would make a certificate. That is not possible this year and so we will be operating on the honor system. 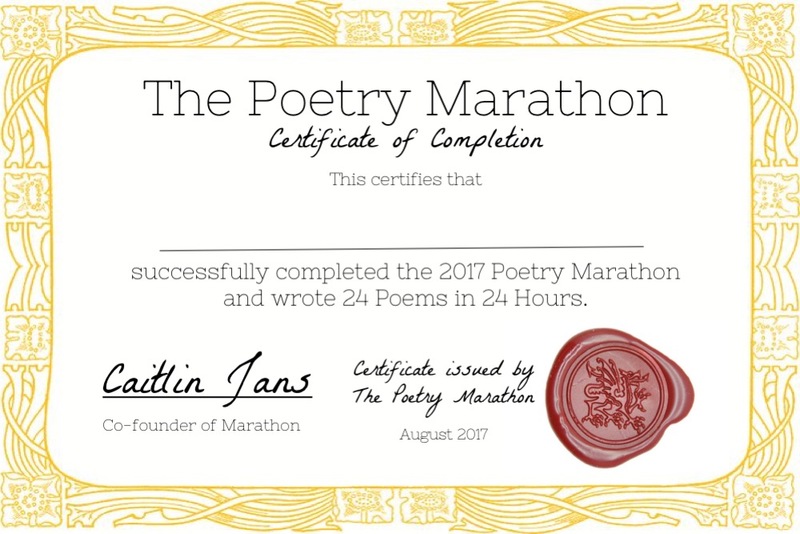 If you completed the full 24 hour Poetry Marathon please consider the following certificate yours, to update with your name, to print if you choose to do so. We will be taking feedback into consideration, so if you really feel strongly about this new state of affairs please email me at poets@thepoetrymarathon.com to explain your position. Only use the link below to access the certificate if you have completed the Full Marathon. 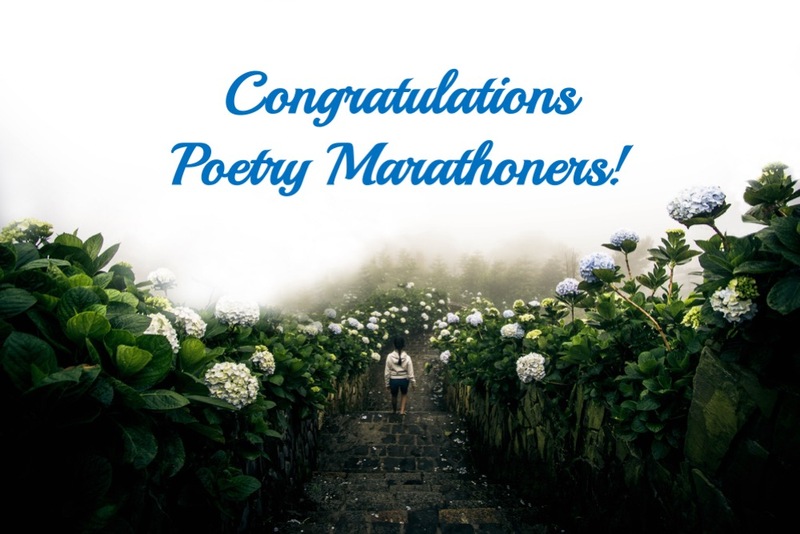 Congratulations again on your completion of The Poetry Marathon. The version that you will download should be easy to edit and add your name to. Also remember that this year we will be putting together a 2017 Poetry Marathon Anthology. Submissions will open August 10th and stay open till the 15th. All submissions must include two poems, no more, no less. All submissions must be made via our email address (poets@thepoetrymarathon.com). The subject line of all emails must be Poetry Submission. Poems must be included in the body of the email. All poems submitted must be written during the 2017 Poetry marathon. All poems should be completely edited and contain no major grammatical errors. You must indicate which hour each poem was written in. Only poets who completed the whole or half marathon will be eligible to submit. There is no guarantee that by submitting your poem will be selected although the goal is to include one poem by everyone who submits. Digital copies will be made available for free to any contributor. Print copies will be available for a reasonable price and any money that is made from them will go towards covering the cost of the marathon. Thank you Caitlan for all you do to make this happen! The prompts were great as were your supportive comments throughout the day and night! 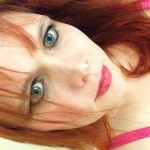 I think everything will stay up for some days – the prompts as well as other people’s work. If that’s incorrect, please let me know. The prompts will stay up as long as the site does. Some people remove there poems within the first couple of weeks some leave them up forever. It is up to you! I am not on facebook, can i still get a download of a winners certificate? Please and thank you. This is event is absolutely brilliant! What am I after the marathon? Thank you Caitlin and Jason. Thank you everyone for making this year such a success. I did it but the last poem had an error when I published it that I only found out when I woke up and saw that it hadn’t been published this morning! I went to sleep before I saw it hadn’t officially been posted XD I was up though and wrote Lady Slumber before the 24 hour mark! It happens! That is ok. I made that exact mistake once. Thanks a huge amount. This was evoking, satisfying, resolving, and fun. Plain fun. Thanks. I did 24 in 24. Will send 2 and would like to see print. See you next year. Well after my first half I felt good. It was fairly easy I felt no sweat. So there is nothing for halfers? There is! They have their own certificate and had two of their own announcement for it. I signed for the half marathon, but completed the 24 hours marathon. Thanking Caitlin and Jacob Jans for such an amazing experience. Also congrats to all my fellow marathoners. Hooray! Glad to hear that! The Facebook group kept me up! I couldn’t resist to finish the excitment! Thank you all! Hmm. When I download the certificate, it is a powerpoint slide, which I cannot edit. Can’t seem to convert it either. I can’t be the only one with this problem?